The Government’s £1.7bn publicly funded Broadband Delivery UK scheme, which has so far helped to extend “superfast broadband” (24Mbps+) networks to 5,076,552 extra premises since 2013, has today published its latest take-up data to the end of 2018. The good news is it continues to grow and boost coverage. The figures reflect the percentage of homes and businesses that have chosen to sign-up with a superfast broadband network (delivered via FTTC, FTTP “full fibre” or Fixed Wireless Access), specifically those which have been delivered via support from the BDUK programme (i.e. % subscribed of premises passed). At present this data is split between the first two phases of the programme and some related phase 2 extension contracts. Phase 1 was broadly dominated by Openreach’s (BT) contracts, while the on-going Phase 2 contracts have attracted a mix of extension deals alongside BT and several alternative network providers. Supported by £530m of public money via the Government (mostly extracted from a small slice of the BBC TV Licence fee), as well as significant match funding from local authorities and the EU. The public funding is then roughly matched by BT’s private investment. Overall it helped to extend “superfast broadband” (24Mbps+) services to cover 90% of homes and businesses in the United Kingdom. Supported by £250m of public money via the Government, as well as match funding from local authorities, Local Growth Deals and private investment from suppliers (e.g. BT, Gigaclear, Airband, Call Flow etc.). This phase extended superfast broadband services to 95% of premises in time for the end of 2017, although some contracts are on-going until c.2020 and will reach beyond 95%. Crucially the BDUK contracts include a clawback (gainshare) clause, which requires the suppliers to return part of the public investment as customer adoption of the new service rises. The funding can then be reinvested to further improve network coverage and speeds via future deals. Efficiency savings from earlier contracts can also be reinvested. So far it looks as if a total of around £721m could in theory be returned via clawback from BT and more than £210m (Jan 2018 figure) from efficiency savings, which may rise again in 2019 (details here and here). 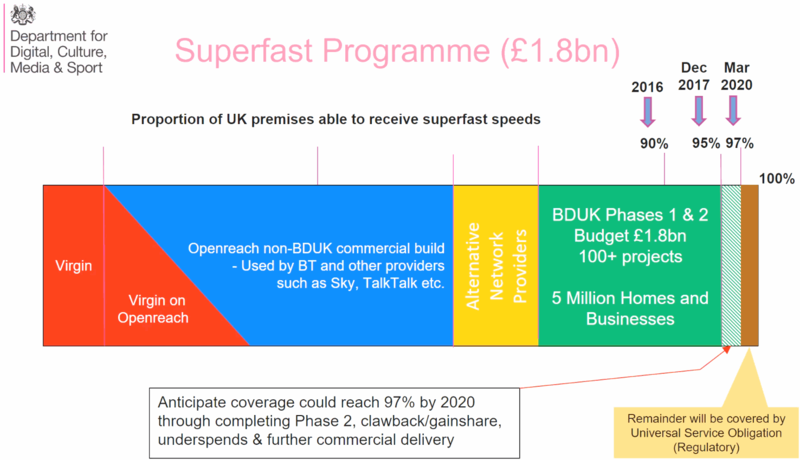 BDUK has estimated that this reinvestment might be enough to boost the UK coverage of fixed line superfast broadband networks to around 97% by March 2020 (possibly 98%+ after that), but this is not an official target. NOTE: Many of the remaining BDUK linked contracts are now focused on deploying ultrafast “full fibre” FTTP. The following tables break the take-up data down by each BDUK local authority (project area) and devolved region (Scotland, Wales etc. ), although for the proper context these percentages should ideally be considered alongside the most recent premises passed (network coverage) data, which can be seen at the bottom of this article. Overall 55.25% of premises have adopted the new service (up from 52.4% in September 2018). NOTE: Some of the counties have divided their deployments into separate contracts. For example, Phase One in Shropshire doesn’t include the ‘Telford and Wrekin‘ area because that is part of a separate Phase Two contract inside the same county. On top of that the contracts were all signed at different times and so are at different stages of development. So far in this phase an overall total of 39.59% (up from 35.7% in September 2018) of premises have adopted the new service and some projects have yet to report. We note that a number of Phase 2 schemes also consist of more than one contract type and so you may see several figures being reported for certain areas in order to reflect each of those deals. IMPORTANT: Take-up is a dynamically scaled measurement, which means that at certain stages of the scheme it may go up or even down depending upon the pace of deployment (i.e. premises passed in any given time-scale), although over time the take-up should only rise. Explained another way, earlier phases of the roll-out were easier and faster to deploy, so you could expect to see a bit of a yo-yo movement with the take-up % sometimes falling if lots of new areas were suddenly covered. Some contracts are also younger than others and will thus take time to catch-up. On top of that BDUK’s roll-out pace has slowed to a crawl as it reaches remote rural areas, which will give take-up a chance to climb. A number of other factors can also impact take-up, such as the higher prices for related “fibre” services, as well as customers being locked into long contracts with their existing ISP (they can’t upgrade immediately) and a lack of general awareness (locals don’t always know that the faster service exists) or interest in the new connectivity (if you have a decent ADSL2+ speed and only basic needs then you might feel less inclined to upgrade). The fear of switching to a different ISP may also obstruct some services. In other cases the new service may run out of capacity (i.e. demand is higher than expected), which means that people who want to upgrade are prevented from doing so until Openreach resolves the problem, although the scale of this issue is fairly small. Now, for some context, here’s the latest progress report on related contracts for the same period (this excludes related match-funding from private investment). The above figures only include 24Mbps+ capable premises in BDUK intervention areas. When are we going to stop calling 24Mbps “superfast” It was super fast 20 years ago, now it’s super slow. Yes but sadly that is the Government’s definition, albeit refined slightly to +30Mbps in recent contracts and by Ofcom, EU etc. 24mbps great for multiple video streams, online gaming and work connections at the same time. Anything more than that is just being greedy. >24Mbps was specified to bring fibre bundles, typically 24 once beyond the AGN node to a point in the network beyond the exchange, be it PCP, Pole(DP) or even FTTP. Important that it was not ADSL2+. It is disappointing the B-USO is be to used in this manner. It was supposed to create a floor not become a ceiling. 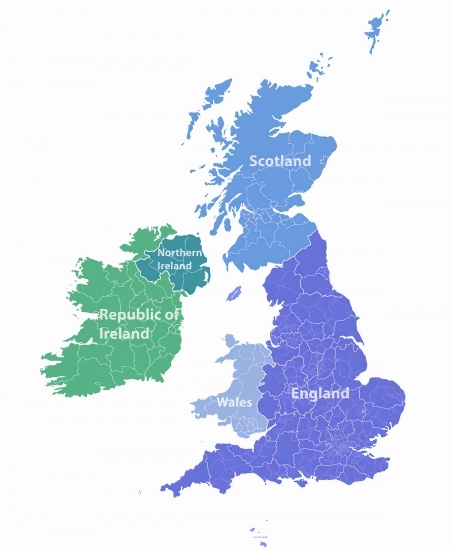 Most counties need to get themselves on the BDUK extended ‘spend-by’ dates so all excess monies (underspends!, capital deferreals and any other balances) reach where originally intended. There are monies enough to another 600-700k full fibre in rural if the appetite is there. DCMS’s official chart doesn’t do a good job of separating this but I believe that bit is intended to reflect the network area where Openreach and Virgin Media overlap (mostly urban areas). This is all very well, but when you are of the 3% that will have to try and enforce an upgrade via the USO it leaves a fairly bitter taste in the mouth. Especially when you consider the vast sums of public money involved (to which i have contributed just the same as everybody else) and that even with the USO the ISP’s still have a get out clause that means they are not actually under any obligation to provide a quality service. You’re in the majority in being a taxpayer that hasn’t benefited from the BDUK programme as that applies to around 70% of us – the 3% plus the approximately two thirds in commercial build areas. In reality relatively little public money has been spent as the high take up means most if not all of the subsidy will be repaid. If only other public contracts used this model! USO will be comfortably under 2% when it by the time its in and start to go live with connections. The problem with the USO is that most eligible properties will cost more than the £3400 cap to connect – that’s why they haven’t been upgraded so far. The only sensible approach for most of them is 4G (or possibly fixed wireless in some areas). The USO isn’t a solution, it is just a political expedient to avoid admitting nothing will be done. The USO does allow a degree of aggregation alongside a model of forecast take-up, which can help to balance the cost of a deployment when looking at an area vs a single dwelling. So don’t just look at the £3.4k cap. Yes, USO aggregation may help in some cases, but I suspect not all. A few years ago I looked at a Community Fibre Partnership for my area. Unfortunately, due to the distance between the groups properties left orphaned by the BDUK FTTC rollout, there were only 6 properties viable for inclusion in my group of properties – the other groups of properties would have to have their own schemes. That left us with a bill of at least £5-7k per property. I don’t expect it has got much cheaper in the intervening time. I have also looked at fixed wireless, leased line, FFTPoD etc. It works out more sensible to give up work and retire early. 4G is the only viable option (until Gigaclear reach my area in a few years time). I’ll use 4G for as long as it allows me to continue to work (maybe a year or two? – data is getting bigger very fast! ), and then if Gigaclear hasn’t reached me by then I’ll give up and retire. AnotherTim: Eh!. Sat or 4g can cover eveyone. Fib is certainly more difficult and uneconomic in many cases though the costs have dropped significantly over the last few years and doubtless gov will probably have another subsidy eventually for all but the hardest cases. @Joe, satellite is totally unusable for my needs – latency is too high (and monthly allowances are far too low). I work from home, and need to access remote software repositories – latency is a big problem (even on a local network!) due to the number of individual transactions involved. Data size is also a growing issue – I’m not at 1TB this month, but getting close. Took me over a week to download some test data! 4G costs are now acceptable (I have Three AYCE for £20pm), but bandwidth in rural areas is still not superfast. By load balancing 4G and ADSL2+ I have an almost usable connection, but latency and bandwidth are very variable which causes some issues. @Tim: Well 99% of people are obviously not going to need what you need so thats USO generally sorted. In terms of 4g as you say its costs and bw packages are now pretty good and getting better all the time. Sat is an option even on latency with the new low Earth orbit sats. They are going to be option fairly soon now. Relatively little public money has been used? The table above shows that local councils and the like have contributed £940 million – that funding is outside of the BDUK repayment scheme. @Joe, it will be years before LOE satellites are an option – just getting enough launch slots, even launching 30 at a time, will take years – and the service won’t be usable until there is a sufficient constellation to provide continuous coverage. Yes, in the end it will be (relatively) little public money. Which just goes to show that BT weren’t willing to take the risk. It’s wholly wrong for public money to be used to offset commercial risk – after all, public-private partnerships are all about transferring risk from the public purse to the private purse – yet BDUK did exactly the opposite. What was that all about ????….. What it was about is BT being treated by the stock market as a cash-generating utility stock, not a risk-taking tech stock. So they weren’t willing to do it on their dollar. @Joe, I think you are being optimistic wrt LOE satellite broadband. OneWeb are in the lead at present, with six satellites in orbit and a small number more ready for launch. They are aiming to start small scale operation with select customers (e.g. airlines, shipping companies) in a couple of years, with full commercial broadband operation in 2027 (if there are no delays). I find myself agreeing with New Londoner for once. If you consider that £1.7bn will fund less than 14 miles of Hugely Stupid 2 rail track, then relatively little public money has been spent. Openreach are a joke. We’ve had a roll of wire on the pole outside our house for four years. Still no fast broadband. We get 2.5mbps. They don’t give a toss about people who live in the countryside. What should happen is you should be charged for what you get. If you are on a scheme that offers 20mbps for 20 pounds a month and you only get 2mbps you should only pay 2 pounds a month. That way there would be an incentive for them to improve your supply. A nice idea but then why would any commercial operator even bother bringing internet capable lines of any speed to a remote rural area, where it costs more to deliver basic infrastructure (due to too few customers over a much bigger area). The sad reality is that it costs disproportionately more to reach such areas, so you’d be creating a further disincentive for investment. What operator in their right mind would even install basic ADSL if each customer is only going to pay £2 per month? The economics just don’t work and push up the subsidy requirements significantly. Also by this definition do people who receive 1000Mbps have to pay £1,000 per month? Perhaps they can add a monthly charge to reflect the amount of infrastructure needed to deliver the service? Either way, Alan’s unlikely to find anyone prepared to provide him with a service at a massive loss. @Alan Perkins. Your situation is more down to the actions and approach of the government than it is OR. Hopefully BDUK will finish the job that they have promised and those left will be covered by the imminent USO registration. The government could introduce a broadband levy to subsidise those without decent speed or simple add more money to the pot but there is no likelihood of that. So realistically it will be 2021/22 but hopefully sooner if engineering work exists. The up side is that you may jump to FTTP quality. In the meantime a 4G solution may be better for service and cost if the outside signal is good and your data use remains moderate. Super fast cymru had an official delivery target of 99% coverage. Airband on Dartmoor and Exmoor, a project that was finished nearly 2 years ago is showing absolutely no increase on the last quarter, still at only 10.1%, about the worst take-up anywhere. What wonderful value for money CDS have delivered with our £4.6m of taxpayer money. Anyone who feels let down by being in the 3% could try to console themselves by looking at regional figures, here 20% can’t get ‘superfast’. Of course its a rural area, so when you’ve upgrading those with the high speed connections in the towns and villages, to higher speeds, it leaves you with the rural properties who get nothing other than false information from Superfast Scotland. Ten years of empty promises is wearing a bit thin. Interesting to see an independent compilation of figures. Our local body in Cheshire (which has been conspicuous by its absence from these pages in the past couple of years) boast of reaching 100,000 premises with a £20m spend, when the reality is only a little over 80,000 with £22½m. Maybe an innocent explanation around different accounting methods, but I wouldn’t bet on it…. Yeah some local authorities aren’t as good as others when it comes to communicating their progress. I often find myself hunting through council meeting documents just to figure out the bits they’re not saying openly. These figures are four weeks old, i.e. need to run update tonight. So if nearly a billion quid is due to be handed back why do my local BDUK keep complaining they don’t have any money to upgrade us? I got a quote for FTTPOD and it was 19k and it covered 14 properties, so I’m sure it’s affordable for them to cover our whole street but they are not interested whatsoever. With an assumed 70% take-up, that equates to around £2k per premises, so BT will be obliged to do it next year on the USO anyway. However, the sting is 4G – if you have 10 Mb/s outdoor 4G from anybody, the USO will not apply, so no upgrade. 19k for 14 premises – how big is the whole street then? NOTE: Some projects may not want to spend all the clawback and savings, since they may want to return it to accounts where the original money was borrowed from. The whole street is 35 properties and then there are another 40 properties on joining roads. We all get sub 13mbps speeds which BDUK have deemed good enough. Remember the 19k quote was for FTTPod so presumably it would be a lot cheaper than that to do all these properties. BDUK are not interested though. The cost per premise may come down, but the price overall would go up i.e. the easier to do premises (if they are) will subsidise the harder to do. Maybe the BDUK project is looking to deal with others with even slower speeds first, so many unknowns that without a massive amount of information from the project and Openreach everything is just lots of conjecture and annoyance at being missed to date. Given those numbers, I fully agree with BDUK – you have a useable connection so the priority for state aid must be those that don’t. How would you justify to somebody with sub-2 Mb/s that you have a more deserving case…? Very true and I have no problem with them targetting even slower areas but we should not be completely cut out of the loop entirely just because it’s useable speeds, 12/1 while OK for a single user is increasingly struggling and won’t cut it at all in a few years time. And with infrastructure all around us alreasy I highly doubt it would be that expensive to do. Tbh if you get >10/1 you connection is prob close enough to an exchange/cabinet that in the end the connection will be upgraded. The USO won’t cover many rural properties as the cost will still be too high for many.